That’s what IKD customer Matt from Orlando, FL, did when installing his custom IKEA kitchen with his wife and father. 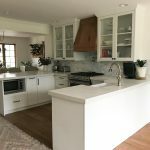 “We have a galley type of kitchen that’s open on both ends, and wanted to fit as much storage as we could,” he explains, adding that it needed to be durable enough for everyday use and stylish enough for entertaining. Matt selected IKEA SEKTION cabinetry frame work with white FORBATTRA cover panels for the upper cabinetry, white MAXIMERA drawers and drawer dividers, and IKEA VARIERA bamboo flatware and utensil trays for added storage options. Those were complemented by a stainless steel Samsung 28.1 cubic foot French door refrigerator with Thru-the-Door Ice and Water; a 36” stainless steel Convertible Wall Mount Range Hood from Home Depot, and a Danby 120 Beverage Can Beverage Center. Yet while they knew what they wanted, making the space work required much-needed design expertise. That’s where IKD came in. Matt explains: “We knew we wanted the huge island, but didn’t know how to go about the design with normal pre-fab cabinets. Working with IKD helped transform our ideas into actual cabinetry that fit into the space.” Matt adds that he also relied on IKD to help him select the subtle touches that completed the sleek look, such as glass inserts for the drawers, plugs to fill holes and drawer dividers. Let’s see how Matt was able to customize his kitchen and make it work! Despite being unfamiliar with IKEA cabinetry, Matt and his wife, Nicole, opted to install it themselves. “The weight of the large cabinets and fitting them on the wall with limited space was a real struggle,” he says. “Those cabinets were heavier than anticipated. We had to install the FORBATTRA cover panels on both sides of the cabinetry and they weigh about 55 lbs. each. Plus the SEKTION cabinetry was about 75-90 lbs. The legs provide zero support until the cabinet is mounted on the rail, and you can’t use them during the process of mounting or they’ll break off.” So the trio used 2x4s to lift the cabinets 4-6” off the ground next to the wall so that they only had to lift 1-2” to get the cabinet onto the rail. The spacious galley-style kitchen offers a sleek and warm feel throughout. Matt explains: “We went with a stainless steel look and it matches perfectly with the hardware we chose for the pulls and knobs.” The stainless steel look is carried through the desired wine/bar area with the Danby 120 Beverage Can Beverage Center, the Frigidaire Professional 36” Induction Cooktop and a 36” stainless steel Convertible Wall Mount Range Hood which hangs nicely between the upper cabinetry. The 11’ center island was a must-have for Matt. “We wanted a space to entertain and we knocked down walls to accommodate it,” he says. “The island fits our sink, dishwasher and garbage/recycle as well as three drawers on each side for prep and pack-up.” He adds: “We can seat five at our island. The kitchen flows into the dining area and all of this space can be seen from the living room.” To accent they hung pendant lights over the island and can lights between the island and cabinet wall.Granite countertops from Stone Spirit, Inc. based in Orlando are featured on the island as well as on the perimeter countertops. With guidance from IKD, the final result captured all of Matt’s design wishes. He explains: “We hired IKD because IKEA’s home planner program is tedious, and we didn’t know what cabinets we could fit, such as installing the cabinetry below the stove and microwave, and putting cabinetry above the refrigerator. 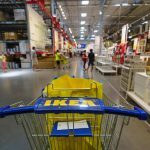 “The team chose IKEA MAXIMERA storage drawers with glass inserts for an elegant look, along with white MAXIMERA drawer dividers. “These worked perfectly to separate items in our bar area,” he says. Bamboo IKEA VARIERA flatware and utensil/knife trays were also used to accommodate silverware and utensil storage options, as were white IKEA VARIERA utensil trays. “We also installed these underneath our cooktop for extra storage,” he concludes.